Mark Walser, a music teacher with Durango School District 9-R, organizes a petition drive to get an initiative on the November ballot to increase education funding in Colorado. More than 100 people gathered in Buckley Park on Friday to support education funding. 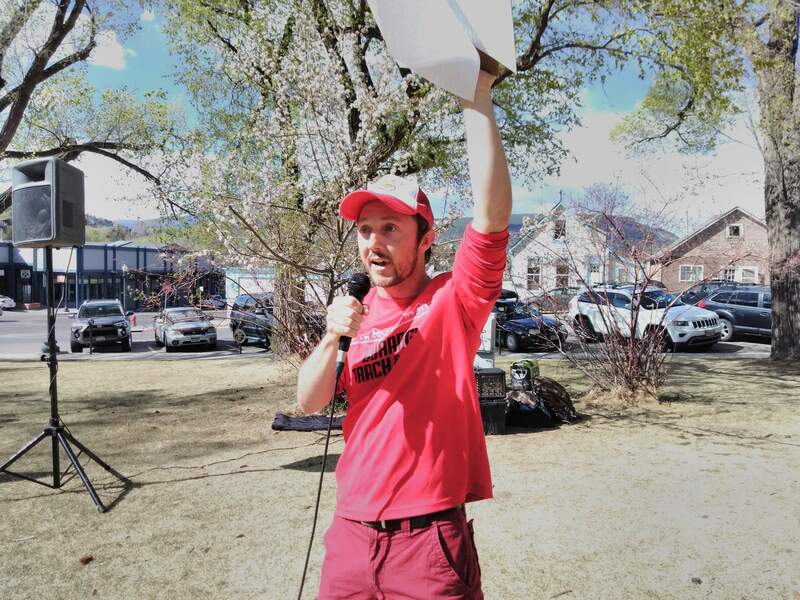 More than 100 people gathered in Buckley Park on Friday for a rally calling for increased spending on education in Colorado. 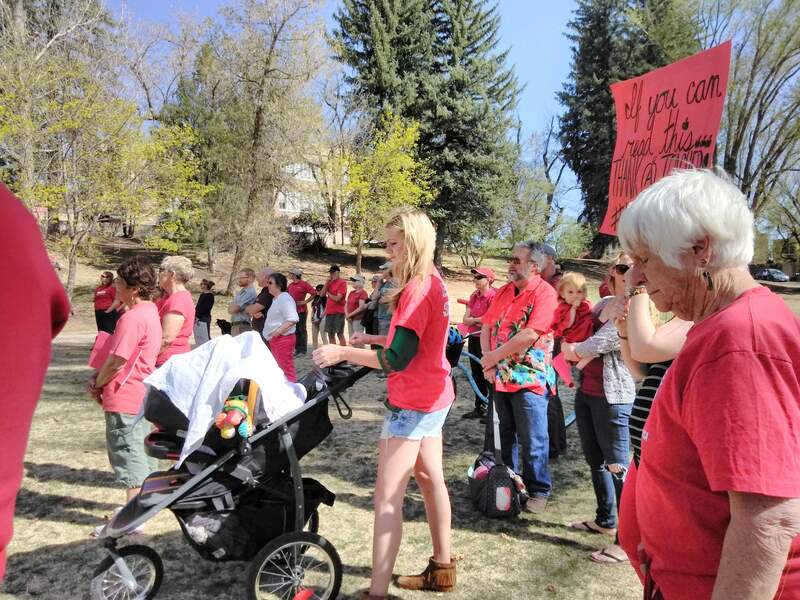 More than 100 supporters streamed into Buckley Park on Friday afternoon to rally for increased education funding in Colorado. Mark Walser, a music teacher at three Durango schools, exhorted support from the crowd, made up largely of fellow educators, to sign Initiative 93 or volunteer to circulate petitions to get it on the ballot for the Nov. 6 General Election. The initiative would raise taxes on high-income earners to increase education funding in Colorado by $726.6 million in fiscal year 2018-19 and $1.6 billion in fiscal year 2019-20. Stephanie Mt Pleasant, who works in the gifted and talented program in Durango schools and serves as president of the Durango Education Association, said the news that a plan by Colorado school superintendents to raise more funding for education had died in the General Assembly only reinforced the need to get Initiative 93 on the ballot. David Dillman, who teaches marketing at Durango High School, said a recent visit to Atlanta shocked him at how Georgia had managed to create a scholarship fund that covered 75 percent of higher education costs for students who graduated high school with a 3.0 grade-point average. He said the scholarship program grew more generous as a student’s GPA went up – eventually covering 100 percent of higher education costs for the top students. “I can’t believe we’ve allowed this state to get in the situation it is in,” he said. Colorado’s education funding, he said, is particularly galling because the state ranks 11th in per-capita income but only 40th in per-pupil funding. Initiative 93 would increase taxes only on people making more than $150,000 per year. People making $150,001 to $200,000 would see a 0.37 percent income tax increase; from $200,001 to $300,000, it would be a 1.37 percent increase; from $300,001 to $500,000, it would be a 2.37 percent increase; and for those making more than $500,000, it would be a 3.62 percent increase. As an attractive place to live, Dillman said, Colorado can hide its inadequate education funding because businesses can hire from across the country to fill high-skilled positions. However, those positions would be filled with more native Coloradans, he said, if only the state’s education system was funded adequately and provided residents with better education. Stories from students in her class have included a talk about what it was like living in an orphanage in Bulgaria and another story from a student about his father who is facing deportation. Kim Martin, a retired teacher and a former 9-R school board member, said education supporters shouldn’t be discouraged by the political obstacles.